Disneyland Lunar New Year 2019 and Get Your Ears On! 2 celebrations going on now at The Disneyland Resort! The Disneyland Resort has 2 special celebrations going on right now! Disney California Adventure (DCA) is ringing in the new year with a Lunar New Year Celebration in honor of 2019, the year of the pig! Now through February 17 there are special shows including Mulan’s Lunar New Year Procession, plus lots of other entertainment, merchandise, and tons of delicious Asian-inspired cuisine! Additionally, at both parks the “Get Your Ears On” celebration is in full swing in honor of Mickey and Minnie’s 90-year legacy. This celebration brings special shows to Disneyland including the all-new Mickey’s Mix Magic, plus both parks get tons of celebration themed merchandise and food! There’s lots to experience right now in both parks, so check out our full report below to see all the new awesomeness! We’re at The Disneyland Resort to check out the 2019 Lunar New Year and “Get Your Ears On!” celebrations! Even the monorails are dressed up for the festivities! First up we’ll head in to DCA! 2019 is the year of the pig, and Disney is celebrating with The Three Little Pigs! You can see these new characters during Mulan’s Lunar New Year Procession (covered later in this report). Let’s check out some of the food and merchandise! For “Get Your Ears On” there are tons of Mickey and Minnie themed things to eat including this insane “Share Your Ears” Cheeseburger available at Smokejumpers Grill. The Cozy Cone Motel has a special Birthday Hat Macaron. Starting February 19 The Plaza Inn will have Celebration Cake which consists of red and yellow cake with raspberry and lemon filling. The Mickey Mouse Club Hat Dessert is available at Jolly Holiday Bakery Cafe. It has a chocolate truffle mousse dome with vanilla bean crème brûlée center. Schmoozies! has this delicious looking Mickey Cookies ‘n’ Cream Shake. It’s a tough choice between the Mickey and Minnie Chocolate Chip Cookie Cupcakes - both available in Mickey’s Toon Town. How cute is this Mickey Mouse souvenir sipper? There are celebration themed bags and shirts. There’s a limited release mystery pin collection. Chef John State walked us through all the Lunar New Year food offerings. There’s way too much to cover everything here, but we’ll give you some of the highlights! This Mickey Chinese Hot Dog Bun is available from Prosperity Bao and Buns. Also available at Prosperity Bao and Buns is the Char Siu Pork Bao with Chinese BBQ pork, pickled red onions, and jalapeño. Vegetarians and vegans have some options this year as well! For vegetarians, among the options is a Vegetable Egg Roll and Chilled Sesame-Garlic Noodles, topped with cilantro-cashew sauce and toasted peanuts. This is available at Longevity Noodle Co.
For vegans, there’s a Crisp Tempeh and Stir-Fry Vegetables (shown above) which includes steamed rice with orange sauce, served family-style with house-made soup at Paradise Garden Grill. We had this and it was great! Vegans can also have the Stir Fried Vegetables and Pineapple with Soy Protein (not shown) available at Lucky 8 Lantern. The Steamed Short Rib Shumai looks tasty! It has spicy Korean sauce, sriracha-mayonnaise, and cucumber salad. This is available at Red Dragon Spice Traders. Macarons have become dessert staples at The Disneyland Resort, and this Purple Yam Macaron with Crème Fraiche has to be one of the fanciest ones I’ve ever seen them offer! It’s available at Red Dragon Spice Traders. There are some great drinks to wash all the food down with too! This is the Orchid Spritz (non-alcoholic), available at Longevity Noodle Co.
Our favorite drink was the Raspberry Lychee Chai Tea (non-alcoholic), available at Red Dragon Spice Traders. There’s a bunch of Lunar New Year themed merchandise available. You can give money to your loved ones in these traditional red envelopes adorned with Disney characters for some added flair. A red Lunar New Year shirt with gold accents. What better way to celebrate the year of the pig than with a piggy bank? A keychain with Mickey holding a lantern. Red and gold mugs with Mickey and Minnie. We headed to Paradise Gardens Park where Brittney and Duff Duff (that’s what she calls her Duffy purse) eagerly awaited Mulan's Lunar New Year Procession. The Three Little Pigs are prominently featured in the show. My favorite part is always the dragon! This fan dance is really beautiful. The vibrant colors of the costumes come to life when the sunlight hits them. Mulan and Mushu are the stars of the show! The procession has 40 performers! There’s lots going on the whole time. We liked the new location in Paradise Gardens Park too. It’s much easier to see, and more people are able to get a great view of the show. The ribbon dancers take advantage of the entire performance area. This year the show ends with a burst of loud firecrackers as the finale! After the show Brittney met with Pluto in his Lunar New Year garb! We then watched Dat Nguyen perform in Paradise Gardens. He’s always a crowd favorite. Dat Nguyen is a talented musician who plays several different instruments during his show. Afterwards Brittney sipped on a Vietnamese Iced Coffee. I got a picture with Mickey in his Lunar New Year outfit! The food booths look great with their new decorative, light-up signage. A few more photos of the merchandise. These lanterns light up! Of course there are ears! This Mickey plush holds a little pig! New banners adorn the walkway. The entrance to Paradise Gardens looks great! It has red accents and hanging lanterns. You can make a wish for the new year on Mickey-shaped cards. Then hang your wish up on the wish wall! Next we head over to Disneyland where Mickey’s Mix Magic is about to begin! This brand new projection show can be seen on Main Street, the water screens on Rivers of America, and the facade of It’s a Small World. Fireworks occur with the show on select nights - you can check the entertainment schedule to see which nights will have fireworks. Luckily for us, it’s a fireworks night! We watched the show in front of It’s a Small World. The entire facade is used as a projection screen for the show. An animated DJ Mickey spins a playlist of remixed Disney songs. There are some less common songs like “Ev’rybody Wants To Be A Cat” from The Aristocats, as well as songs you might expect like “Let it Go” from Frozen. The Haunted Mansion segment was my favorite! There’s a projection of the pipe organ from the ballroom scene in the mansion. 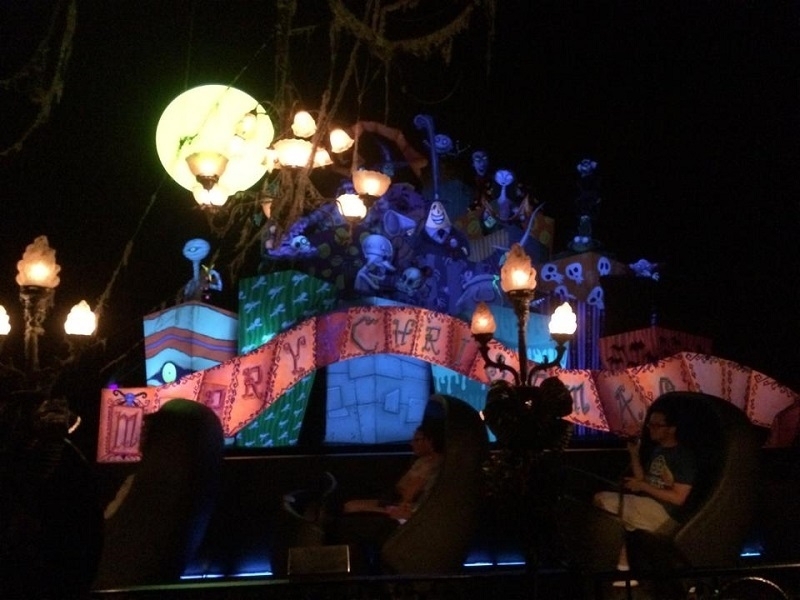 And some grim grinning ghosts come out to socialize. Here’s a photo from the Frozen segment. There are some animations from Wreck it Ralph. Mickey gets a big smooch from Minnie at the end! Congrats on 90 years you two! And of course, if you see the show on a fireworks night, there’s a grand finale that lights up the entire sky! After Mickey’s Mix Magic we headed to the brand new Tropical Hideaway! This wasn’t part of the media event, but I wanted to check it out because I've been excited for this since it was announced, and it’s finally here! It turned out really great! There are lots of little details all around the restaurant, and you can tell that a lot of thought was put into the environment. Unfortunately the magic carpets aren’t for sale! The aged floor tiles add to the feel of the restaurant. But what makes this place so, so, so great is that there’s Dole Whip! And you’re no longer limited to just pineapple flavor! There are floats, swirls, and loaded whips with pineapple, orange, and raspberry flavors available! Brittney and I get Dole Whip every time we visit Disneyland, and I can say with certainty that we’ll be getting it at this location from now on! The new flavors are awesome! There are also some unique food items available if you’re feeling hungry! In addition to what’s shown above, you can get Sweet Lumpia that has cream cheese, pineapple, and Dole pineapple dipping sauce. My favorite idea with the restaurant was to include Rosita, a talking Tiki Room bird, to entertain guests. In The Tiki Room, Jose always asks “I wonder what happened to Rosita…” but it never gets answered. Now, after all these years, we find out she’s right outside! This is the perfect bridge between The Tiki Room and The Jungle Cruise as well, as she tells jokes and one-liners just like a Jungle Cruise skipper. There are Jungle Cruise boats moored beside the restaurant. I just love how the existing ride was used to open up the environment and make the relatively small restaurant space feel much more expansive. Definitely check out The Tropical Hideaway on your next visit! It’s a wonderful and under-rated addition to the park! Back on Main Street there’s a Valentine’s Day photo op. Heart decorations adorn the lawn in front of Main Street Station. “Get Your Ears On” banners line Main Street. Of course the Minnie ones have polka-dots! Sleeping Beauty Castle is being refurbished right now so that it looks in tip-top shape when Star Wars: Galaxy’s Edge opens later this year. Let’s check out some of the “Get Your Ears On” merchandise! Brittney loved these special 90th celebration Tsum Tsums. She stacked them up into a pyramid for the photo because she believes that Tsum Tsums should always be stacked! There are lots of shirts. Mickey’s 90th mugs - I like the 90 on the handle! This bag celebrates Mickey over the years, and has even more Mickeys on the back! These 2019 shirts are hot off the press! Food-themed merchandise is a big trend right now. Here are some donut ears. A Mickey-pepperoni pizza purse looks too tasty to wear! A donut bag to match your donut ears! Brittney is all about these food plushies. The dole whip, while not new, is still her favorite! Minnie’s “Rock The Dots” merchandise is featured front-and-center in some stores. Over in the World of Disney store there’s a big “Get Your Ears On” display. Purple merchandise is all the rage right now too! These Small World themed bags are unique! These 3d art displays were cool too! You can build a 3d scene from The Mad Tea Party, Splash Mountain, It’s a Small World, or Haunted Mansion. We had an awesome day at The Disneyland Resort checking out the Lunar New Year Celebration and “Get Your Ears On!” The Lunar New Year Celebration runs through February 17, 2019! Get Your Ears On doesn’t have an end date set yet, but we’d recommend visiting by February 17 so that you can see both celebrations! Thanks to Disney for inviting us to check out the festivities, and thanks to you for reading our report! Last edited by ILoveRides on Sun Feb 03, 2019 5:29 pm. Re: Disneyland Lunar New Year 2019 and Get Your Ears On! great report, and thanks so much for the pics of Tropical Hideaway. looks like a fantastic place to stop, and get some of those treats. . and agreed, the use of jungle cruise boats to add to the environment is brilliant. Note to self: Check out Tropical Hideaway when in DL this coming September. Thanks for another awesome TR of all that's happening during the Lunar New Year celebrations! Between the merchandise, the food....and the food....I'd be broke just after walking into the park, LOL! Great shots of everything there, you covered. Thanks for sharing it all. Happy Lunar New Year Everybody! Why am I always hungry after every report you guys do?!?! And now there's even food merchandise?!?! And a new Dole Whip area?!?! Oh my god, I might have to call in sick to work tomorrow and just drive to Disneyland to check out the new restaurant by Jungle Cruise. I remember seeing the concept art and it looked fantastic!